Kohler Co. recommends that their freestanding baths be installed with access from below. In cases where access from below has been provided, the following disassembly procedure is not needed. 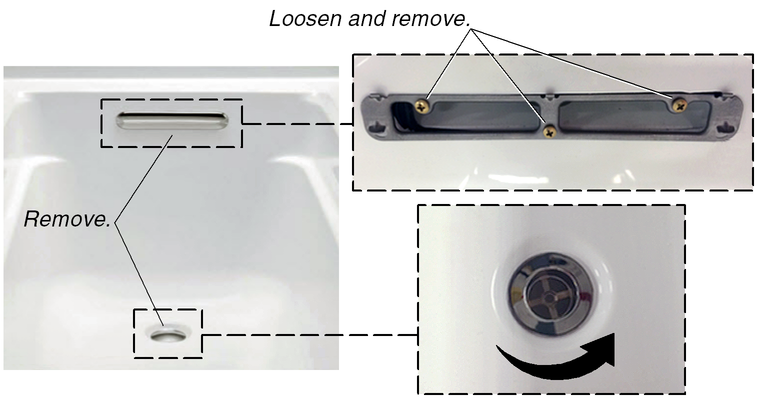 If access from below was not provided for your freestanding bath installation, follow the steps below to disassemble and remove the bath from the shroud for any servicing required. NOTE: Two people are required to lift and move this product. NOTE: The drain and overflow for your product may differ in appearance from the one shown. The disassembly and removal procedures remain the same. NOTE: Retain all the components for reassembly. Remove the drain and overflow covers. Loosen and remove the overflow flange screws, and remove the overflow flange. Turn the drain strainer counterclockwise to loosen and remove. Unplug the blower (some models) and any connections. With help, carefully lift the bath up and away from the shroud. Carefully set the bath on the floor to service as needed. Follow the installation instructions to reinstall.